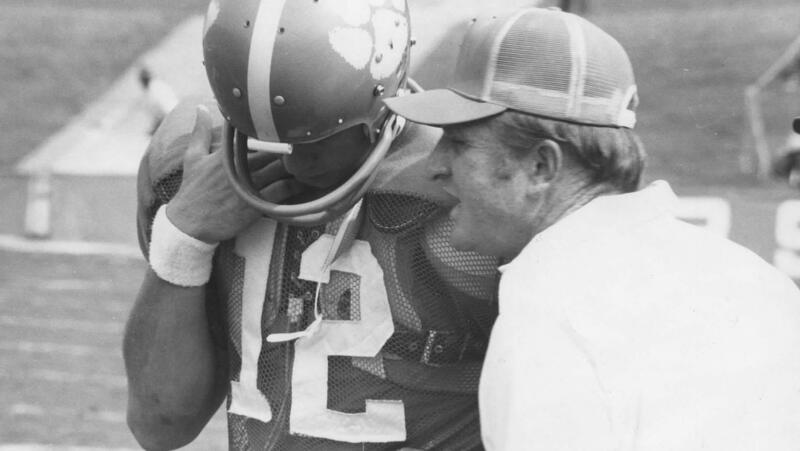 By Will VandervortWhen his Tigers ran out of the dressing room and onto the field at Memorial Stadium for the first time in his career as Clemson head coach against The Citadel on September 8, 1973, Red Parker remembered that the atmosphere was pretty stale. In fact, as the former head coach recalled, there was no energy at all in the stadium. And due to that, his Tigers played stale as they squeaked out a 14-12 victory. That following Monday morning, Parker went to then Athletic Director Bill McLellan and said they needed to do something to get the spirit and enthusiasm back in Death Valley. “One of the things that struck me as being a goldmine of potential was the Tigers running down the Hill in the east endzone,” said Parker. “I saw that as a spirit uplifter. Clemson had stopped running down the Hill in 1970 following Howard’s final year as head coach in 1969. During that period of thought, “the most exciting 25 seconds in college football” was re-introduced to Tiger fans. However, it was not done the way most remembered it. “When I first started coming to Clemson games in 1964, they did not run down the Hill like they do now,” said Clemson Senior Associate Sports Information Director Sam Blackman. “When Coach Howard was here, they dressed inside old Fike Fieldhouse and would leave to go to the stadium from there. They would walk down Williamson Road. I can still see those helmets bouncing up and down as they were coming down the street. You could see the tip of the orange helmets just over the fence. “Coach Howard had the team enter the stadium through a fence that used to sit at the top of the Hill. They did it as a convenience more than anything else. Learning how Howard’s teams ran down the Hill, and why they did it, helped Parker get creative with the entrance. Knowing he had to use the west endzone locker rooms, Parker thought of a plan that has been used by every Clemson coach since. Clemson’s next home game in 1973 did not take place until October 6. The Tigers were coming off back-to-back road losses at Georgia and Georgia Tech, and Parker was anxious to see how the crowd would respond as Clemson ran down the Hill prior to its battle with Texas A&M. “We always used two buses to go to the motel the previous night, and then we took the bus to the stadium and dressed for the game. After we took the field and warmed up, we came back in the dressing room and did everything we needed to do. And it still does today. No one in college football has such a unique entrance as Clemson’s. Just check the Ring of Honor and you will see the names Jerry Butler and Steve Fuller, who were members of the 1975 Clemson recruiting class and players recruited by Parker.